The Nycor Group, Inc., with divisions ranked in the industry's "Top 25" by the Minneapolis / St. Paul Business Journal, is a firmly established, successful contract consulting, retained and contingency, search firm with a national reach. For over 50 years, Nycor has built enduring relationships with clients ranging from emerging growth and dynamic technology companies to Fortune 500 companies. 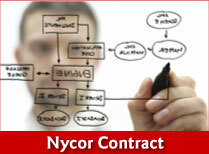 A 93% rate of repeat business in recent years attests to the high level of satisfaction enjoyed among Nycor's clients. Nycor Search, Inc. - contingency and retained search firm specializing in Engineering, Information Technology, Energy Services, Manufacturing, Management and Leadership roles. We have consistently been successful matching both technical requirements to core competencies, and corporate culture to personalities. Nycor Technical, Inc., ranked in the industry's "Top 25" by the Minneapolis / St. Paul Business Journal, provides contract, contract-to-direct, and direct-hire staffing services for skilled labor in precision Manufacturing and Design / Drafting. In addition, we regularly provide staff for short and long term assignments in areas including: Purchasing / Procurement, Customer Service, Quality, Call Center Operations, and Assembly. 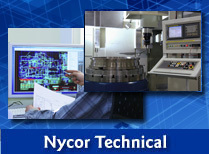 Nycor Contract Services, Inc. provides profesional-level contract consultants for projects within the Engineering, Information Technology, and Manufacturing industry sectors. 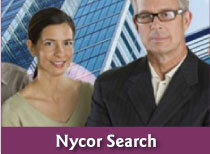 Ranked in the industry's "Top 25" by the Minneapolis Business Journal, Nycor Search Inc. is one of the leading search firms in the Midwest, specializing in professional-level search services within Engineering, and Information Technology, for individual contributor positions to management, director, and leadership roles. 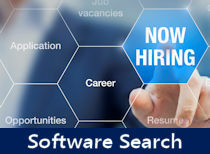 Software Search is an Information Technology recruiting agency specializing in the nationwide recruitment, placement, and contracting of IT professionals. Any information gathered or received by The Nycor Group will be used only by the following affiliated companies:Nycor Contract Services, Inc., Nycor Search, Inc., Nycor Technical Inc., and Accounting-E.D.P., Inc. for employment and placement purposes only. If you are a candidate seeking employment your information will only be given to prospective employers and will not be given out for any other purpose without your consent. If you are employed by one of the above-named affiliated companies, your information will become a part of our human resources file and may be used for employment purposes. If you are a company using the services of any of the above-named affiliated companies as a prospective employer, your information will be given only to the affiliated companies and prospective candidates for employment and no other purpose.